Berlin: Pierre-Emerick Aubameyang converted a second-half penalty to seal Borussia Dortmund's 2-1 win over Eintracht Frankfurt in Saturday's German Cup final -- on what could be his final Dortmund appearance. Aubameyang's calmly taken spot-kick was his 40th goal this season for Dortmund in all competitions and ended Dortmund's misery after losing the three previous cup finals in Berlin in 2014, 2015 and 2016. His winning penalty was Aubameyang's 120th goal in his 190th game in four seasons with Dortmund. 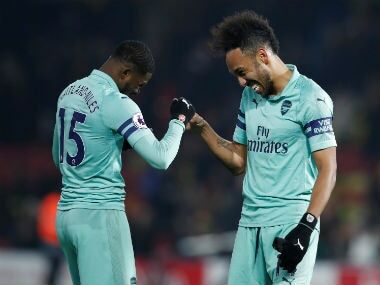 However, despite having a contract until 2020, this could be Aubameyang's final appearance having said he will decide his future after talks with Dortmund's bosses. After Dortmund took the lead at Berlin's Olympic Stadium through Ousmane Dembele's early goal, Frankfurt's forward Ante Rebic's equalised to make it 1-1 at the break before Aubameyang turned the game. Dortmund coach Thomas Tuchel praised his team, who have bounced back from the April 11 bomb attack on their team bus to win silverware this season having finished third in the Bundesliga. "I am spent, I must admit, after watching that," said Tuchel. "We started really well, then stopped playing and were lucky not to fall behind, but we dug deep and now everything is perfect." Dortmund romped to a 3-1 home Bundesliga win over Frankfurt in mid-April, but this was a much bolder performance from Niko Kovic's Eintracht, who had won only one of their previous ten games coming into the Berlin final. Dortmund took the lead with just eight minutes gone when Dembele was released down the right flank and the fleet-footed 20-year-old cut inside Frankfurt defender Jesus Vallejo and curled his shot into the net. But Eintracht started to pressurise the Dortmund defence. Frankfurt's US international Timothy Chandler whipped in a cross and Croatia international Rebic was just inches from connecting with the goal at his mercy. 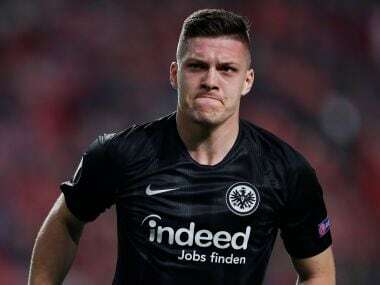 He made no mistake on 29 minutes when Serbia midfielder Mijat Gacinovic's superb pass split the Dortmund defence and released Rebic, who slotted his shot past Dortmund goalkeeper Roman Burki. Frankfurt should have taken the lead when Rebic traded passes with Haris Seferovic whose shot beat Burki, but hit the post on 39 minutes. Neither Dortmund captain Marcel Schmelzer nor playmaker Marco Reus came out for the second half. Schmelzer had carried a leg knock into the final, while Reus injured his right knee midway through the first half. 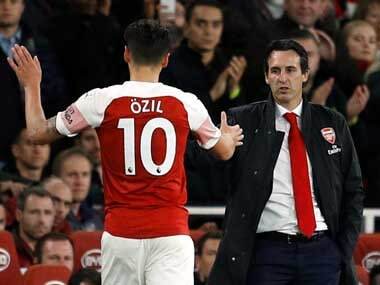 Tuchel responded by switching from a 3-3-2-2 formation to a 4-5-1 formation with Aubameyang, the Bundesliga's top scorer this season with 31 goals, as the loan striker. Japan midfielder fired at Frankfurt goalkeeper Lukas Hradecky just after the break. But the scene was set for Aubameyang. His flying bicycle kick was only cleared off the line by Frankfurt's Mexico international Marco Fabian on 64 minutes. And the Gabon hot-shot showed a cool head by slotting the winning penalty straight down the middle on 67 minutes after substitute Christian Pulisic was brought down by Frankfurt's goalkeeper Lukas Hradecky. 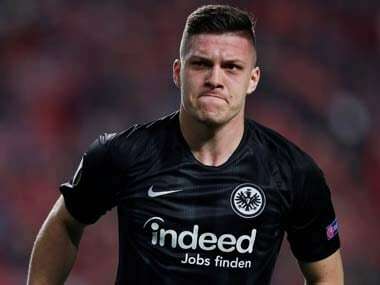 Frankfurt boss Kovac responded by bringing on Frankfurt's burly striker Alexander Meier, 34, the Bundesliga's top-scorer in 2014/15, for the final 20 minutes to try to force an equaliser to no avail.